Some animals live in packs, some wander alone but all of them need a little love. So much so, that sometimes they decide to visit humans to say 'hi'. Bored Panda has collected pictures of some of the most unexpected animal visits that humans had which prove friendships are universal and not bound by the number of legs. 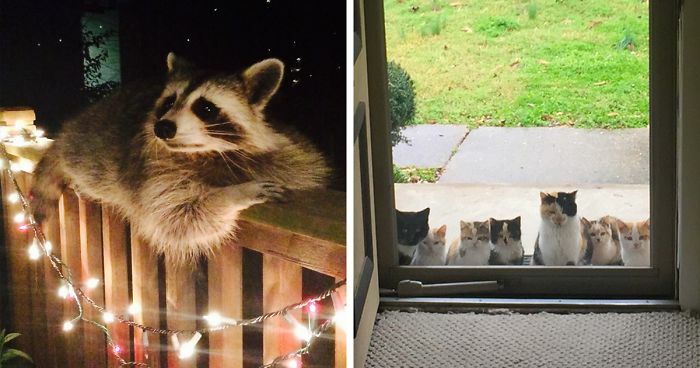 From a raccoon chilling on a porch, to an owl at a Super Bowl party - these animals seek human companionship just as much as we seek theirs. It's nice to know that despite our industrial attempts to screw up nature some creatures still believe that deep down we're all of the same kind. Scroll down to vote for your favorite images and let us know in the comments why you liked them! "So guys, how was your week?" "Honey? I think Barney grew antlers..."
Hello! Do you have a moment to talk about our lord and savior? "Ummm...excuse me, hate to disturb, but can I have my brekky now, please?!" Little fellow had a note saying "No longer able to care for my children. Please help." And for some reason they are always smiling as they take over your heart. I hope you kept him! we have a mother and 3 foxes visit our garden every day, the mother is so tame she takes food out of my hand !! This toad has more style than most people you meet on the street! You saved the little fellow from that mean old orca the other day out in the bay, and it thinks you are now its champion. My boot would stay open indefinitely. #36 So I Just Woke Up At 4:45 Am With A Non-Stop Meowing Noise. Open My Apartment Door And This Little Guy Came Running In. Should I Keep Him? If you aren't careful this cat burglar will steal your heart, and you'll be thoroughly possessed. #41 After Nursing Hercules For 4 Weeks, I Released Him Outside, And He Has Been Coming Back To Visit Every Day! I'll bet he has a complete list of "Places to mooch" somewhere in that devious little brain. "Stop smoking human, it's bad for you, pet me instead!" When a bunny loves a hedgehog very much, the you might end up with this little long eared pincushion. #53 Found The Crab Apple Bandits! I grew up in Alaska, and these are the last things you want hanging around your house. They are very good at trampling people when they don't get their way. Well consider yourself to be f**king lucky!!! Nice neighborhood. How are the schools? Your boyfriend is a squirrel? #62 There Has Been A Stray Cat Outside Of My House Since Summer. Today We Decided To Let Him Inside To Stay Warm And A Few Hours Later We Found Him Like This! You are now a cat owner! Hey, wanna build me a house in that maple over there? #64 This Little Guy Jumped Up In My Work Truck With Me For A Bit. Best Day Ever! So, so cute! 😍😍 Also adorable comment: Best day ever! Aaaaw! Baby O'Possums are absolutely precious. They love to snuggle and will ride around on your shoulder if they get used to you. That's the Perfect Gift for you to leave with the neighbor you can't stand. Nothing like a little Getevenwithemism. #74 Found This Little Guy Swimming In Our Pool! Go home, raccoon, you're drunk. #76 He Jumped In My Car And Wouldn't Let Me Leave Without Him. I Don't Own A Cat. Is This How You Get A Cat? Don't talk, just drive, hoomin!